1. At the invitation of His Excellency, Mr Jacob Gedleyihlekisa Zuma, President of the Republic of South Africa (RSA), His Excellency, Mr Joseph Kabila Kabange, President of the Democratic Republic of the Congo (DRC), visited the Republic of South Africa on 25 June 2017 on the occasion of the Tenth Session of the Bi-National Commission (BNC) between RSA and the DRC. Both Heads of State were accompanied by delegations of Ministers and Senior Government Officials. The meeting of the two Heads of State was preceded by a Ministerial Meeting which took place on 24 June 2017 and Senior Officials’ Meetings which were held from 21 to 23 June 2017. 2. The two Heads of State received a report of the Ministerial Commission on the implementation of the signed agreements and the commitments and recommendations made during the 9th Session of the BNC. These commitments and recommendations concern cooperation projects in the following fields: Politics and Governance; Defence and Security; Economy, Finance and Infrastructure; and Social and Humanitarian Affairs. This report was used to review the bilateral cooperation between the two countries. 3. The Heads of State expressed their satisfaction with the successful conclusion of the political dialogue initiated by HE Joseph Kabila Kabange, having resulted in the appointment of a Prime Minister, the establishment of a Government of National Unity and the strengthening of democracy, which would pave the way for the holding of elections in the DRC. The Heads of State urged their electoral bodies to work together to enhance the quality and credibility of the upcoming elections. 4. HE President Jacob Gedleyihlekisa Zuma expressed his satisfaction with the progress achieved by HE President Joseph Kabila Kabange and the Government of the DRC in identifying a contractor for the implementation of the Grand Inga Project. 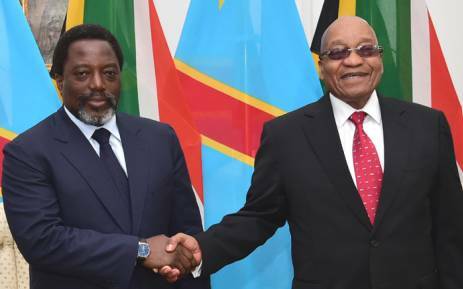 Both Heads of State called for the full implementation of the Grand Inga Treaty that was signed in Kinshasa on 29 October 2013 between DRC and South Africa. In this regard, they encouraged the African financial institutions to assist in the implementation of the Grand Inga Project. 5. The two Heads of State noted the positive developments with regard to an immigration agreement, which would facilitate movement of diplomats and officials of the two countries. They urged Ministers, within whose mandate this matter resides, to make the necessary arrangements to sign this agreement expeditiously as all legal requirements have been complied with. 6. The two Heads of State witnessed the signing of the Memorandum of Understanding between the Cross Border Road Transport Agency and the Office for the Management of Multimodal Freight. 7. The two Heads of State reiterated their willingness to improve and strengthen economic relations between the two countries by facilitating trade and removing all impediments constraining bilateral trade and investment. In this connection, the Heads of State directed that the Treaty on the Avoidance of Double Taxation should be implemented now that all legal requirements have been fulfilled. 8. The two Heads of State also used the occasion of the 10th Session of the BNC to exchange views on regional, continental and international issues. On regional issues, they noted with appreciation the ongoing work by the Southern African Development Community regarding regional integration. On continental issues, the two Heads of State expressed their commitment to African unity and integration within the framework of the Constitutive Act of the African Union and to the peaceful resolution of conflicts, as well as African renewal, specifically through the implementation of the African Union’s Agenda 2063. 9. Within this context, the two Heads of State reflected on the need to peace, security and stability in the region and the continent to end the suffering of the local populations. To this end they agreed that it was imperative for Africa to draw on its own resources and capabilities to achieve its objective of a prosperous Africa at peace with itself. In this regard, they expressed concern with the interference of some actors outside of Africa in domestic affairs, which threatens to undermine the sovereignty of African countries. 10. The two Heads of State reiterated their common view on the need for the reform of multilateral institutions particularly the Bretton Woods Institutions and the Security Council to include the interests of the developing countries; and expressed concern about the recent withdrawal from the Paris Agreement on climate change by the United States of America. 11. At the conclusion of the BNC, His Excellency, Mr Joseph Kabila Kabange, expressed to his South African counterpart, His Excellency, Mr Jacob Gedleyihlekisa Zuma, President of the Republic of South Africa to the people and the Government of the Republic of South Africa, his sincere appreciation and gratitude for the warm, friendly and fraternal welcome and hospitality accorded to him and his delegation. 12. In conclusion, both Leaders agreed that the 11th Session of the BNC will be held in the DRC in 2018 on a date to be mutually determined through the diplomatic channels.